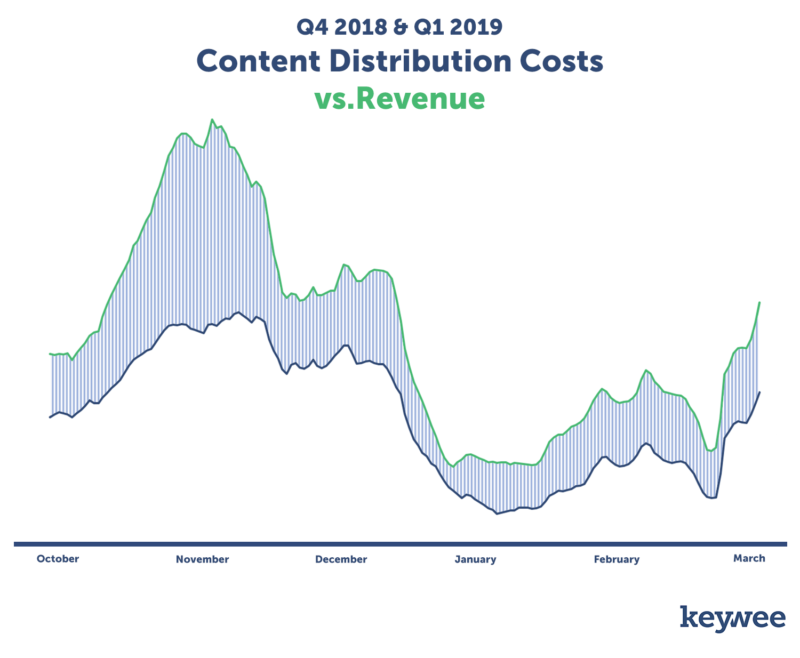 In the wake of ongoing Facebook changes, we launched The Keywee Facebook CPC Tracker to provide publishers with monthly updates on Facebook CPCs and industry trends, based on analysis of data from over 500 publishers. Every month we release new data along with relevant insights on content distribution. You can sign up for monthly updates straight to your inbox here and read past months’ updates here. Recently, we’ve seen publishers focusing on attracting and retaining younger audiences — a key goal for ensuring the future success of any business. For example, Nordic publisher Schibsted launched an app designed for users between the ages of 18-25. Within the app, all news stories are visually led and interpreted for younger audiences. This plan seems to have worked; as of today, 60% of its app users are under 25. Meanwhile, this month the Wall Street Journal created a “Young Audiences” newsroom department, a multi-disciplinary department designed to create new content and curate existing content for younger audiences. Of course, publishers are also focusing on how to generate revenue today. For many publishers, this means weighing a variety of revenue streams and deciding where to focus their limited resources. Many publishers have turned to affiliate and commerce content as a scalable revenue steam. BuzzFeed’s commerce business drove more than $250 million in transactions in 2018 and made the publisher a top-five referrer of traffic to Amazon. This year, in addition to custom content with affiliate links, BuzzFeed has started offering a new shoppable ad unit for relevant shopping posts. Launchpad, an agency that sits within Turner, also recently introduced new products to help with sales and lead generation, including ads that allow audiences to buy products directly inside social posts. 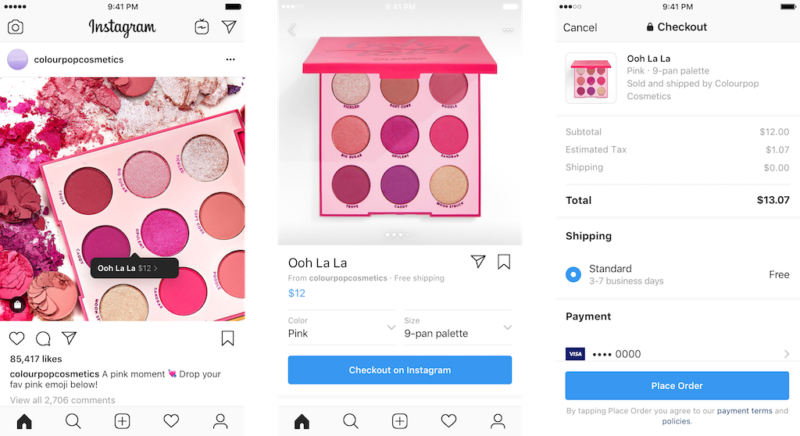 This will soon be a reality for many more companies, as Instagram recently rolled out its Checkout feature, allowing users to make purchases directly from the Instagram app. While it’s currently only available for organic posts and select brands, a larger rollout is expected. When publishers find something that works, they double down on it. We’ve seen this happen in the world of audio reporting and podcasting. The New York Times, following the success of its hit podcast The Daily, announced multiple new hires to strengthen its audio team and expand its projects. NBC News and MSNBC are also expanding their podcast teams before election season. They’ll not only increase the frequency of current shows, but also introduce new, standalone podcasts. Even Twitter joined the club, launching its own podcast this month. For many publishers, podcasts are about more than just a new advertising channel. In addition to ad revenue, The Guardian has seen great success using its podcast to drive people to its membership program. And as always, storytellers are constantly looking for new channels on which to distribute their content. In March, we saw several big-name platforms try to prove their worth. Twitter debuted a new analytics tools for publishers to better understand the content that’s resonating best with their readers. Similarly, Pinterest is working hard to make a name for itself as “the go-to planning and discovery platform.” Even Google, an industry giant, took steps to woo publishers with the launch of GNI Subscriptions Lab, a six-month program to help local publishers launch paid products. 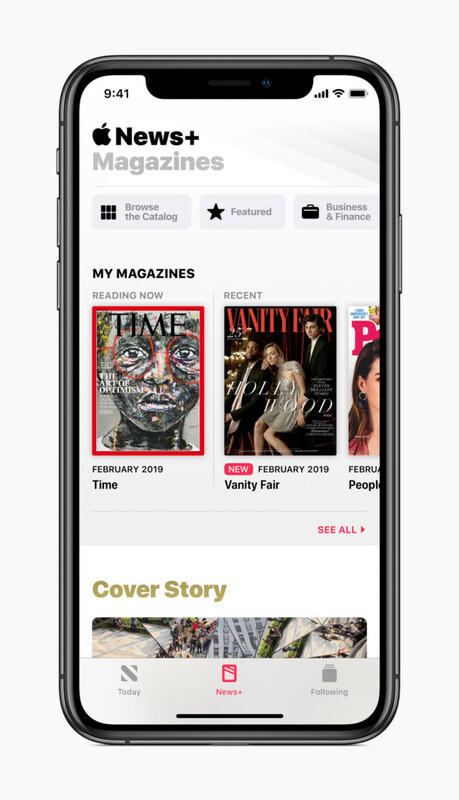 Of course, the biggest news in content distribution in March was the launch of Apple News+, a new paid tier of Apple News that provides access to hundreds of magazines and news outlets. Participating publishers, like The Wall Street Journal, see it as an opportunity to drive a broader and more qualified audience to their content. In March, we saw a 13% increase in CPCs on Facebook. While last year we saw March prices on par with February’s, this is more in line with our expectation for the end of a quarter; we typically expect an increase in CPCs due to increased demand from advertisers who are spending their remaining budgets to hit their quarterly goals. In 2018, the strange pricing trend was largely due to an above-average increase in CPCs in February. In fact, despite the lower March pricing, the percentage increase in CPCs from January to March was higher in 2018 than it was in 2019. 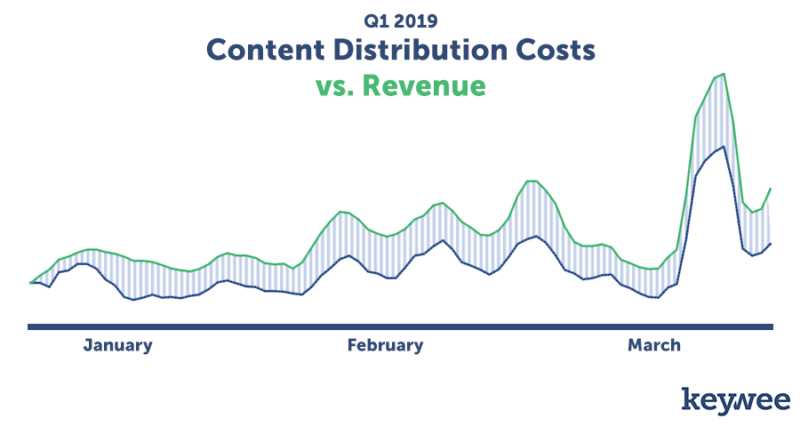 Despite the increase in the cost of content distribution this month, many publishers saw success driving immediate ROI from their content. Specifically, we saw large spending increases for affiliate revenue campaigns, as well as campaigns that optimized around same-session ad revenue. In the early days of digital publishing, the business model was centered around display advertising. While the industry has certainly changed over the years, most publishers still rely on advertising as part of a broader, diversified revenue portfolio. Part of the industry’s evolution has included a greater set of responsibilities placed on audience development teams, including growing a newsletter database and even driving paid subscriptions. But with this increasing list of KPIs, audience development teams have found their budgets and resources stretched thin and ROI difficult to prove. For this reason, we’ve seen many publishers shift their paid media strategy in the past couple of years. Rather than simply reducing content distribution CPCs, they’re maximizing same-session ROI. In other words, they’re spending in such a way that the ad revenue from driving traffic is greater than the traffic acquisition cost. This allows them to almost immediately reinvest their earnings back into their campaigns, scaling their acquisition efforts continuously. Teams employing this strategy can spend aggressively to acquire and retain their audiences, even when distribution prices increase, so long as advertising revenue is also increasing. Below, you can see a comparison of the distribution costs and the on-site revenue of publishers utilizing this method. While costs sharply increased toward the end of March, so did the revenue these publishers were driving. 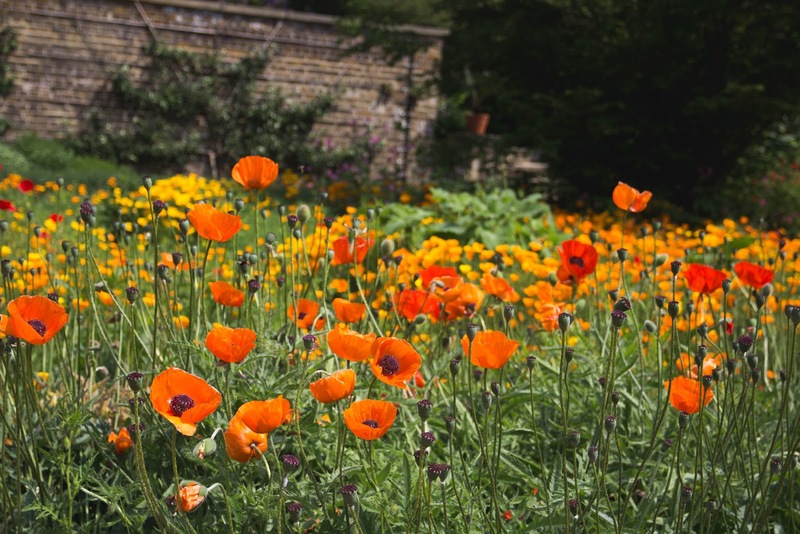 This allowed them to maintain and grow traffic and engagement on their site, despite higher distribution prices. In fact, although content distribution prices are certainly one part of the ROI equation, often the periods with the highest prices are also the ones with the greatest opportunity for profit. 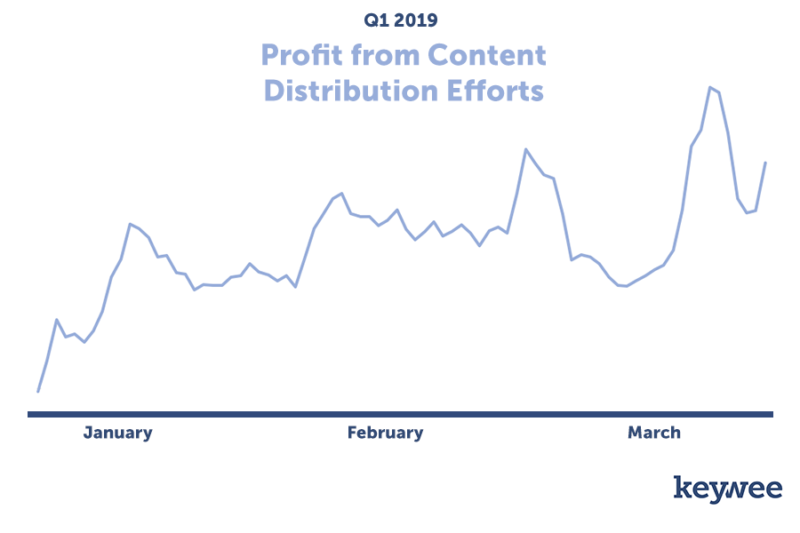 Below is the profit these publishers made in Q1 (also depicted by the distance between the two lines in the previous graph). Notice that profits are at their highest at the end of February and the end of March, when CPCs were also at their peak. This happens regularly, since the same factors that cause prices to increase on Facebook (holidays, ends of quarters, higher advertiser demand in general), also typically cause display advertising RPMs to increase. There’s no better example of this than Q4 (see graph below). While the costs of content distribution are at their peak for the year in November around Thanksgiving, so are on-site RPMs (depicted by the large distance between the cost and revenue lines below). While teams with limited budgets may consider abstaining from spending on platforms during these hyper-expensive times, teams that practice profitable audience development can often benefit the most. So while costs increased in March, the corresponding increase of RPMs made it easier for many publishers to continue to scale their campaigns during this time. If you’re interested in learning more about the mechanics of this process, and if it might be relevant for your team, email info@keywee.co for access to our most recent white paper, Audience Development: From Cost Center to Profit Driver.